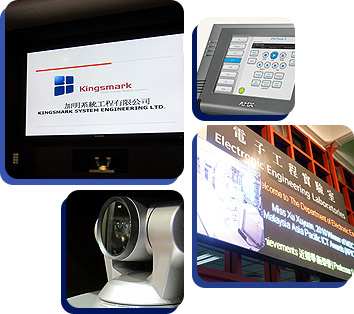 Since its establishment in 1993, Kingsmark Limited has been an agency of selling and designing display devices solution in Hong Kong and major China city. As well we together provide engineering installation services and after sales services to our reliable professional brand, such as Toshiba, SONY, Mitsubishi, ELMO, Grandview, Sharp product. 2016 SONY Professional PTZ camera product to Hong Kong market. Grandview Ultra HD projection screen to Hong Kong market. 2015 Konftel Audio conference product to Hong Kong market. Grandview Motorized bracket to Hong Kong market. 2014 Toshiba LCD large display wall product to Hong Kong market. Hitec Speaker product to Hong Kong market. 2013 Toshiba LCD plasma product to Hong Kong market. Hitec Central control product to Hong Kong market. Aoitec Switchable glass product to Hong Kong market. 2012 Sharp Interactive board product to Hong Kong market. WG LCD large display wall product to Hong Kong market. 2011 Yamaha Audio conference product to Hong Kong market. Sharp LCD large display wall product to Hong Kong market. Grandview Bracket product Hong Kong market. 2010 Mitsubishi DLP large display wall product to Hong Kong market. Elmo Interactive board product to Hong Kong market. Sharp LCD display product to Hong Kong market. 2009 eInstruction Interactive board product to Hong Kong market. Ultralift Motorized bracket to Hong Kong market. 2008 NTT Audio conference product to Hong Kong market. SCT DLP large display wall product to Hong Kong market. KIMOTO Projection screen product to Hong Kong market. 2007 Mitsubishi Projector product to Hong Kong market. TVlogic LCD large display wall product to China & Hong Kong market. 2006 Sony Professional camera product China & Hong Kong market. Abtus Bracket product China & Hong Kong market. 2004 Hitec Visualizer product Hong Kong market. 2003 Elmo Visualizer product to China & Hong Kong market. Hitachi Projector product to Hong Kong market. Grandview Projection screen product to Oversea & Hong Kong market. Sony Video conference product to China & Hong Kong market. Toshiba DLP large display wall product to China & Hong Kong market. 2001 Elmo Camera product to China & Hong Kong market. Sony Projector product to Hong Kong market. UMU Switchable glass product to Hong Kong market. 1999 Pioneer DVD product technical support on Hong Kong market. Toshiba Projetor product to Hong Kong market. Toshiba LCD plasma product to Hong Kong market. Sony LCD plasma product to Hong Kong market. 1998 Sony Boardcasting product to China market. Pioneer LCD plasma product to China & Hong Kong market. Sony CRT large display wall product to China & Hong Kong market. Toshiba CRT large display wall product to China market. Teclock Measuring prodict to China and Hong Kong market. Hitec Display wall processor product to China & Hong Kong market. 1993 Hong Kong Company establish. Toshiba CRT large display wall product to Hong Kong market.